It might come as a surprise to some people that the appearance of our tongues can be indicators of our overall health. The best time to examine your tongue to get the most accurate reading is right after waking up in the morning, before brushing your teeth, sipping any water, or eating anything at all. According to 1MD, if your tongue is pink with no abnormalities of shape or size, and has no damage to it, then your health, overall, is quite good. In such cases, even a light white coating is nothing to be concerned about. If your tongue is red, appears inflamed in size, and has some surface abnormalities, then that is a sign that you may be dealing with an inflammatory disorder or have an infectious disease. According to Healthline, a red tongue that is inflamed may also indicate that you have a vitamin B12 deficiency, celiac disease, or anemia. Regardless, if your tongue is red and inflamed, then you should seek medical attention. As mentioned, a red, inflamed tongue may indicate an infectious disease. But, if your tongue is bright-red, enlarged, or even has the appearance of a strawberry, then likely something more serious is coming into play; it may indicate a serious inflammatory blood disease called Kawasaki disease, or an indicator of scarlet fever. According to the American Academy of Dermatology Association, another common cause of a bright-red tongue is heart disease and high blood pressure. If your tongue has this appearance, you should have your blood pressure checked and have your doctor schedule an electrocardiogram (EKG). Sometimes, a yellow tongue is not indicative of anything; according to The Mayo Clinic, it could simply be due to a build-up of dead cells on the papillae that gives it a yellow appearance. However, if you do have a yellow tongue, you shouldn’t assume that the issue is as harmless as that, and you should pay attention to other possible symptoms like fatigue, excessive gas, and frequent nausea or queasiness, as a yellow tongue can be an indication of jaundice, which means your liver or gallbladder is not functioning properly. You may also have other serious digestive problems, and this needs to be examined by a doctor—especially if the yellow color sticks around, and you start having other symptoms of liver or digestive illness. 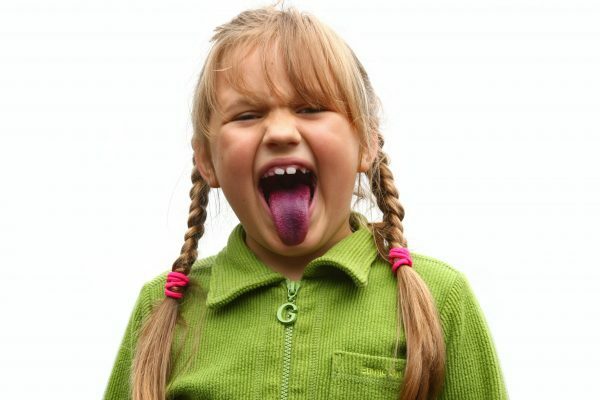 If you’ve just eaten a purple popsicle or candy, then having a purple tongue is expected. However, if you examine your tongue first thing in the morning and it looks like that, then it’s a worrisome sign of having blood circulation problems or vitamin B12 deficiency. Even if there are no other symptoms, a purple tongue, or purple spots, is reason enough to see a doctor. According to Healthline, a purple coloring may be due to the fact that your blood is not supplying enough oxygen to all of the cells of the body, which may indicate lung or heart problems, and it should be examined right away. The longer this issue is neglected, though, the graver the consequences may be over time, as your body is being deprived of oxygen. Just like having a purple tongue, a blue tongue is also a clear indication of oxygen deficiency, possibly due to lung or heart problems. The difference is that the blue color is usually tied to adrenal gland problems, which according to Austin Publishing Group, means a serious adrenal inefficiency—also known as Addison’s disease, where not enough of the adrenal hormones, aldosterone and cortisol, are produced. If your tongue is smooth and pale, then you are likely deficient in vitamin B12, according to the Merck Manual, a situation which can be quite serious if it is not taken care of. Such a deficiency may mean pernicious anemia, a condition where vitamins are not being absorbed properly, or may be the result of an autoimmune disorder attacking the cells that produce proteins that help the body absorb this important vitamin. Also, pay attention to symptoms such as fatigue or the feeling of coming down with the flu. You will need to get your vitamin B12 levels checked so an appropriate treatment protocol can be prescribed by your doctor. As mentioned above, a thin white coating on your tongue is nothing to be concerned about. However, if your tongue is too white to have been caused by a bit of bacterial activity, then that’s something to be concerned about. And, according to Colgate, a white tongue can be caused by several issues. It may be caused by dehydration, in which case, simply drink more water, or get an IV if you are too sick to retain it. It may be the result of a flu virus and a sign that your white cells are working hard. Or, if your oral hygiene is poor, a white tongue can result from extreme build up of bacteria or fungi. Thrush, a common fungal oral infection, can cause your tongue to turn white. Be sure to keep an eye on your tongue even if you are asymptomatic or while improving your oral hygiene. And if the white color stays, then you need to find out the cause. If you are examining your tongue and find that you have grey patches all over it, then you should assess your oral hygiene by visiting your dentist and see if there are ways you can make improvements. It can also be a sign of fungal infections like thrush, yet grey patches on the tongue can be even more of a concern. According to the Canadian Cancer Society, those grey patches are called leukoplakia. Often, they are harmless, but sometimes it can be a sign of oral cancer. Either way, if your tongue is grey, you should see your doctor to rule out any serious possibilities. The idea of your tongue turning black and hairy is cringeworthy, but it does happen. It signifies that your oral hygiene is poor and that you are allowing bacteria to flourish, which can cause it to turn black, and may be a sign of serious neglect of your oral health. Smoking, drinking a lot of coffee, side effects from medications, or radiation therapy can also cause these scary symptoms, according to WebMD. 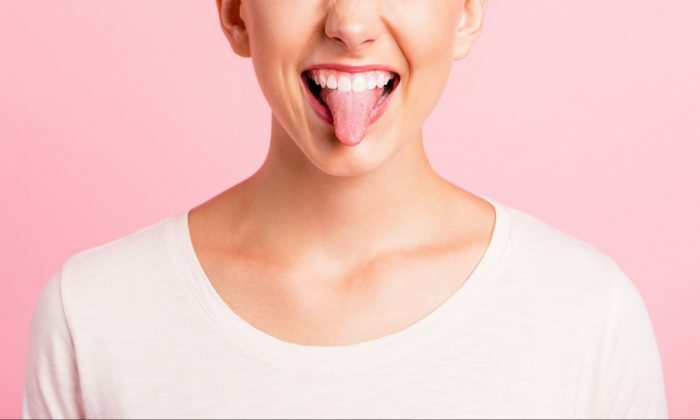 If you take a look at your tongue first thing in the morning and it is enlarged, bumpy, or fissured, then there could be several causes coming into play. According to The Cleveland Clinic, such symptoms may be caused by smoking, which irritates the tongue, or possibly by oral cancer, which means you should see a doctor. However, it may also be caused by less serious conditions such as having canker sores due to a virus, or being run down—both which should resolve themselves. Or if you’ve experienced physical trauma, then that could also cause such symptoms. If you wake up with a black coating on your tongue, but is otherwise normal, and if you took Pepto Bismol or a similar product due to having an upset stomach the night before, then such a symptom is to be expected. According to the MSD Manual, all you need to do is remove the coating by using a tongue scraper or a toothbrush. Chances are your tongue will be back to normal afterward. However, if you still have this discoloration and it stays, it could be a sign of more serious issues such as oral cancer, but you will need to see your doctor to make that determination. A geographic tongue may appear as having red, smooth areas with white borders. And, in some cases, areas of the tongue may appear yellow and white with a rough look. 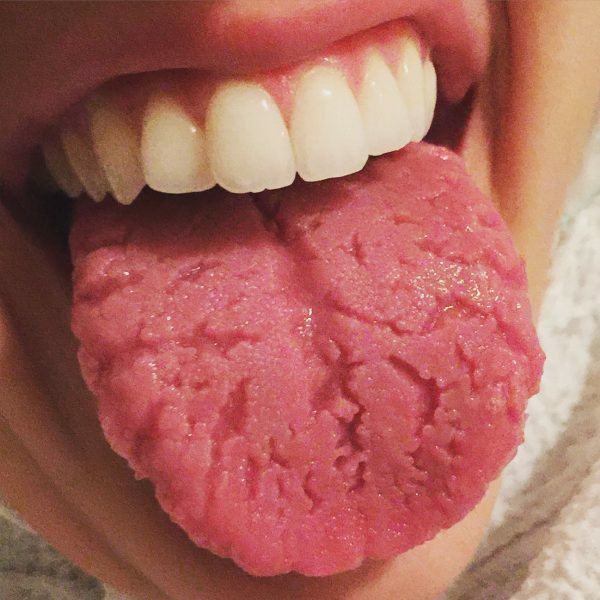 According to the MSD Manual, a geographic tongue is caused by psoriasis, an autoimmune disease associated with psoriatic arthritis and other conditions. You should keep an eye out for other skin changes on your body, too, as psoriasis can affect the skin, in which case, you should see your doctor, as it will require treatment.